NEW YORK (CNNMoney.com) -- The effort to recover money for victims of Bernard Madoff took a dramatic turn Friday when officials said the widow of one of the Ponzi scheme's biggest beneficiaries had agreed to turn over $7.2 billion. Preet Bharara, U.S. attorney for the Southern District of New York, said that the widow of deceased billionaire Jeffry Picower had agreed to return "proceeds" collected over 35 years. He said it was the largest forfeiture in U.S. history. The $7.2 billion represents more than one third of the total losses from Madoff's crime. "Barbara Picower today has done the right thing," said Bharara, in a press conference at his Manhattan office. "I commend Barbara Picower for agreeing to return this staggering sum, which was really always other people's money." Bharara said the $7.2 billion, combined with the $2.6 billion already recovered in stolen assets, is nearly half of the $20 billion lost to Madoff's scheme. Irving Picard, the court-appointed trustee in the Madoff case, said that recovering the Picower funds through negotiation spared the victims the lengthy recovery process that would have resulted from litigation. Barbara Picower said, in a prepared statement, that "this settlement honors what Jeffry would have wanted, which is to return this money so that it can go directly to the victims of Madoff." 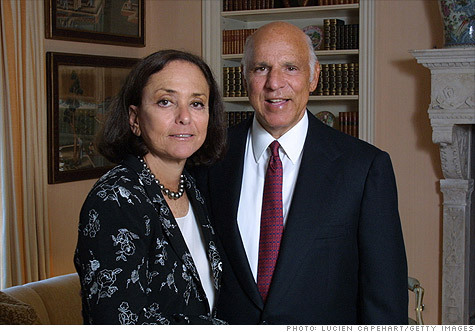 Picower, a philanthropist, was the most prominent of the successful Madoff investors. His wife, Barbara, discovered him unconscious in the pool of their Palm Beach, Fla., home on Oct. 25, 2009. He was pronounced dead at a nearby hospital following a heart attack. Earlier that year, Picard claimed in court filings that Picower was a key beneficiary of Madoff's scheme. The trustee said Picower had withdrawn $7.8 billion from Madoff's firm since the 1970s, even though he only deposited $619 million. Picower "knew or should have known that [he] was profiting from fraud, because of the highly implausible high rates of return" on his accounts, the trustee said. His widow has denied that her late husband knew he was benefiting from a scam. "I am absolutely confident that my husband Jeffry was in no way complicit in Madoff's fraud and want to underscore the fact that neither the trustee nor the U.S. attorney has charged him with any illegal conduct," she said. Picower also said she hopes the settlement will ease the suffering of the victims. Madoff pleaded guilty in March 2009 to orchestrating the most massive Ponzi scheme in history. He used his Manhattan investment firm as a front for the pyramid-style scam. He stole money from investors while claiming to be investing it in the markets. He would provide the stolen money to his more mature investors, like Picower, while fraudulently claiming that the returns were legitimate. The trustee has sued at least 400 investors, who withdrew more money from Madoff than they invested. Many of these investors say that had no idea Madoff was operating a Ponzi scheme, and they thought they were withdrawing legitimate returns. The trustee said that sued investors can apply for his hardship program and he is examining these situations on a case by case basis. "We recognize that many of these individuals are not in a financial position to return all or part of the excess withdrawals," he said. More than 16,000 people have filed claims to the trustee, claiming that they lost money to Madoff's scheme. The trustee has rejected the majority of these claims -- in some cases, because the investors withdrew more than they invested. The trustee has acknowledged 2,363 claims as legitimate; totaling nearly $5.9 billion in damages. The Securities Investor Protection Corp., which provides insurance to burned investors, will cover $768 million of the damages to investors. The remaining $5.1 billion in damages would be compensated, or at least partially, by the recovered assets. Meanwhile, Madoff is serving a 150-year sentence in a medium security federal prison in Butner, N.C.
On Dec. 11, the second anniversary of Madoff's arrest, his son Mark committed suicide. The trustee had sued Mark Madoff and other family members for tens of millions of dollars, though he had not been charged with a crime. -- CNN's Brian Vitagliano contributed to this report.